I like the ability to mount ISO images on my operating system. Have used this feature for a long time. Up until now, I had to install a third party ISO mounting software for that. While that worked nicely, it was always a burden to install those virtual hardware drivers to add support for that and it sometimes caused issues during upgrades. 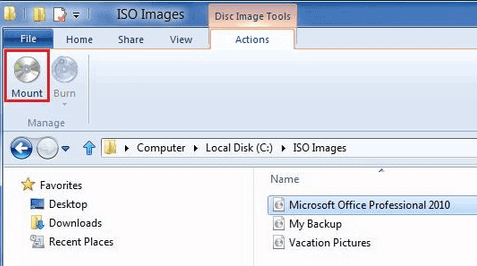 Mounting ISO images can have lots of advantages. For one, you may not need to burn an ISO to DVD if you have downloaded it from the Internet to play media or install software. Another benefit are holiday tours with your laptop. Instead of having to take your precious DVD movies or Blu-Ray movies with you, you can create ISO images instead and store them on the hard drive. While you may want to turn those ISO images into video files to save space, you don't need to if you have space in abundance. If you ever had the pleasure of going on holiday with children, you may know how media can look like on the return home (if you ever find it again that is). Windows 7 came with capabilities to burn iso images to disc but it lacked the ability to mount ISO images natively. A recent blog post at the Building Windows 8 blog highlights that Microsoft will support ISO mounting under Windows 8 natively. ISO images are mounted either with a double-click in the new Windows Explorer or by selecting the Mount option from the actions menu. The ISO image then becomes available as a new drive on the operating system. All of its files are then accessible directly in Windows. This behavior is similar to that of third party ISO mounting tools like ISODisk, WinCDEmu or Virtual Clone Drive. The very same mounting options are available for virtual hard drive files as well, with the difference that they appear as hard drives and not optical drives in Windows Explorer. Here is a video that demonstrates both the ISO and VHD mounting capabilities of Windows 8. ISO is definitely the most used formats when it comes to virtual disk image formats. Third party tools still offer some advantages like additional disk format support that Windows 8 still does not support. Microsoft's Windows 8 operating system will support mounting ISO images natively. Nice. I really like to have the most I can get “native” than having to install 3rd party software. What are the chances they will support bin, mds, nrg…? ISO mounting is good but without supporting more types there will be a need for additional software. I’d say Microsoft will stick to ISO and not support other disk formats as well. I wonder how much DRM this will be encumbered with? Hoi Martin, from your article and the video i still do not understand or i can burn images with it? You can do that in Windows 7 already Paulus. I’ve always used WinCDemu without problem, overhead, driver, registration or fee. Gee, only 12 years after it first should have been available. I mean, hey, great job to give us this capability, Microsoft, but you are so late to this party and you didn’t even bring enough potato chips for everyone — no ability to create ISO images. This is about as cutting edge as the Palm Pilot.